It is no secret that the United Nations has long been viewed as a hotbed of anti-Israel sentiment. However, there has been a remarkable shift in recent years as a result of efforts by the United States under outgoing U.S. Ambassador Nikki Haley and Israeli Ambassador Danny Danon to build new partnerships while singling bias, as well as anti-Semitism towards the Jewish state. were on display this week when the U.N. General Assembly considered a U.S.-sponsored resolution condemning the Palestinian terrorist group Hamas for the first time. The resolution, which gained a simple majority in voting, received strong support, especially from Israel’s allies in Europe and elsewhere. 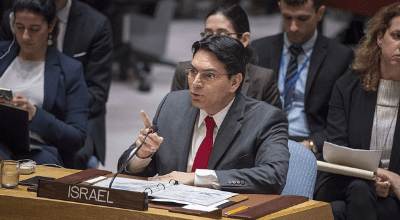 While ultimately the United Nations failed to adopt the resolution, as a result of a last-minute amendment by Kuwait to force a two-thirds majority, Danon is optimistic about Israel’s prospects in the world body going forward. JNS spoke with Danon by phone. The interview has been edited for brevity and clarity. Q: What is your reaction to U.S. President Donald Trump nominating Heather Nauert to replace Nikki Haley as U.S. ambassador to the United Nations? A: We continue to receive the full support of the U.S. at the U.N. We know Heather Nauert is a friend of Israel, and, no doubt, we will continue with the momentum that we created together with Ambassador Haley. We thank Haley for the partnership and friendship, and we know she will truly continue to support Israel in the future. Q: Do you plan to meet with Nauert in the near future? A: Usually, we wait until after the nomination in accordance with protocol. But we are looking forward to working with her. Q: If Nauert is confirmed by the U.S. Senate, do you plan to meet with her on day one? A: We are here waiting; whenever she arrives, we will do our best to introduce her to the right people. I know now she’s in a very demanding position, but in coming to the U.N., it’s a completely different ballgame. Q: Speaking of the demanding position, what are your expectations for Nauert in what will be big shoes to fill? A: As I’ve said, we have the momentum, and we don’t play defense anymore at the U.N. We had the vote condemning Hamas that got the support of 87 member states. It was very impressive. We are not only defending, but we’re also initiating. And that should be the approach of Israel, for sure, and I believe also for the U.S.
Q: You mentioned Thursday’s resolution.What is your overall reaction to the United Nations acting in the first place to even consider it? A: We have a lot of hypocrisies at the U.N. It’s unfortunate we have countries that are not able to condemn a terrorist organization. They will pay the price for it because if you cannot condemn terrorism in Israel, no one will condemn terrorism when it will arrive in those countries. We are happy with the result, but I think those countries not supportive of the resolution should be ashamed of themselves. Q: Kuwait changed the voting requirements for the resolution to have a two-thirds majority for passage. Would the U.S. or Israel have been able to file a motion for the vote to switch back from a two-thirds majority to a simple majority for adoption? A: There was a preliminary vote, and on that vote, the numbers were very close—74 against 72—so it was very close to dropping the two-thirds requirement. It shows the hypocrisy of the U.N.: When you had resolutions condemning Israel—and we had too many of those in the last few days—no one required a two-thirds majority. But when it comes to condemning Hamas, that’s when you see the so-called great countries coming together and putting out different procedural maneuvers to defeat the resolution. Q: With what Kuwait did, how will that affect Israel’s approach to that country? A: It’s not Kuwait because Kuwait is part of the Arab League. When I speak with Arab ambassadors, the way they talk about Hamas is not the way we think about Hamas. So it’s unfortunate that they cannot stand up and condemn terrorism because those same radical groups threaten their countries as well. I know exactly what they think or what they believe, but when it comes to Israel, they fail to see Hamas and the Palestinian Authority working together against the resolution. It was a shocking because we know what relationships they have between them. Q: Guatemala voted for the two-thirds requirement. Considering it moved its embassy in Israel from Tel Aviv to Jerusalem, what is your reaction to Guatemala voting for the Kuwait motion? A: Guatemala is a good friend of Israel. I haven’t spoken yet with the ambassador, so we need to understand whether there was an ideology behind it, or sometimes, a mistake. Sometimes, because you have amendments and resolutions, people don’t vote exactly the way they should have. But they supported the resolution, and they support Israel. Q: You mention the Arab League. How receptive have the rest of the U.N. members been to the resolution? A: When you look at the numbers, go the E.U. united on this resolution; it was very impressive and required a lot of work for the U.S. mission. You see countries in Latin America, Mexico, Argentina, Chile, supporting the resolution. I think it’s impressive to see so many countries condemn terrorism. Q: With the E.U. voting in favor of the resolution, will we see a shift in their approach to terrorism, considering their continued support for the 2015 Iran deal? A: I think countries condemn terrorism, no matter what. We appreciated the support of the E.U. to vote altogether for the resolution. I can speak separately on the Iran deal, but I think yesterday we saw that you can disagree on one thing, but when it comes to condemning Hamas terrorism, you had the full support of the E.U. Q: But Iran is the world’s leading state sponsor of terrorism. Isn’t there an inconsistency here? A: We are grateful for the support we saw yesterday, and we will continue to present our position regarding the Iran deal. We do believe the E.U. should be supporting the U.S. sanctions, and they should apply more sanctions. When you have a change, you should be thankful for that, which happened yesterday. There were some resolutions which passed last week about the Temple Mount. The E.U. commented that it will not support the resolution in the future if the language does not include the Hebrew name of the Temple Mount because the Palestinians refer to it only by their Arabic name. Q: With the European Union voting against the resolution, do you think it is making progress in its relationship with Israel, despite its support for BDS? A: Yesterday, we saw progress. It’s not in all forms, so we still have a lot of work to do. But we know the E.U. You have to work with each member state individually. Q: What is your take on Israel’s trying to forge relationships with African countries, such as Oman? A: We think it’s very important, and that’s how it starts. We have strong bilateral relationships, and we have a lot of support in the things we do together, but we want to see it publicly. That’s something we are working on, and we’re starting to see results. Q: Is there any chance of reform at the United Nations? A: Yes. I’m optimistic. We proved in the last two years with the work we did with Ambassador Haley. We will see changes at the U.N., and we will see that the atmosphere is different. Q: Do you plan to reintroduce Thursday’s resolution in the near future? A: We’ll come back to that. I don’t know if it’ll be in the near future. But we will continue to expose Hamas and, after much support, we can push the resolution forward. Q: What about a resolution condemning Hezbollah, especially with the group digging tunnels to infiltrate and attack Israel? A: With Hezbollah, we are pushing for a resolution on that in the Security Council. I think there will be a debate, probably next week about that. We think it’s about time that the U.N. will designate Hezbollah as a terrorist organization. Q: What’s your reaction to incoming Brazilian President Jair Bolsonaro announcing he will move the Brazilian embassy in Israel to Jerusalem? A: We are looking forward to welcoming him in Jerusalem. When they move their embassy, it will be a great sign for other countries in Latin America. Q: Have you been in touch with Bolsonaro? A: Not yet. But I have a good friend who is close to him. I spoke yesterday with the Brazilian ambassador at the U.N., and Prime Minister Netanyahu is scheduled to fly to the inauguration in the beginning of next month. Q: Do you know when he Bolsonaro plans to move the embassy? A: No. I don’t know. But during the campaign he made a commitment and from our experiences with another president who made a commitment during his own campaign, we are very optimistic. A: We will continue with the momentum we created with Ambassador Haley with the new incoming ambassador. They know we were able to change the atmosphere in the U.N., and we are determined to continue with that momentum.